Phi Phi Don, or Koh Phi Phi Don is quickly becoming one of the most sought after holiday destinations in the world. Most popular with travelers from Europe, Japan and South East Asia, this wonderful island is the largest of the Phi Phi islands. People from around the world flock to this island to enjoy its many amazing sites, sounds and tastes. Phi Phi Don is accessible by boat, ferry or water taxi from Phuket and Krabi Province. The trip from Phuket is roughly 90 minutes and brings you into Tonsai Bay. Both day trippers and holiday travelers enjoy this incredible island with the peak of the people being there between 10am and 3pm on most days. Phi Phi Don is about 6 miles long and 2.5 miles wide and in the shape of a dumbbell. The island is predominantly mountain and has very little flat land for development which makes it a beautiful Holiday Destination with jungle and coconut covered cliffs and slopes. All around Phi Phi Don are clear and clean waters full of tropical marine life, coral reefs and an amazing adventure land for water sport enthusiasts. The diving off Phi Phi Don is perhaps not as dramatic as the best Phi Phi Dive sites on the sister island of Phi Phi Ley as the reefs are shallower but these do offer some interesting diving especially when the main reefs get busier or in the wet season when the weather is poor. Phi Phi Don is the main location of the Phi Phi Dive schools with some 20 shops where you learn diving. PADI Courses are the most popular on Phi Phi Don but SSI is available for those who prefer that. The best snorkeling on Phi Phi Island is around Phi Phi Don as the reefs are shallow and there are a multitude of differing marine environments that give a great range of marine life. Reefs, boulders, walls, slow and fast currents all create differing situations where differing marine life thrives. The snorkeling off Long Beach offers some of the best snorkeling on Phi Phi Don. Some of Thailand's best kayaking can be found under the walls of Phi Phi Don on the west coast. Sheer cliffs plunge very dramatically into a deep sea. Caves, blow holes and overhangs feature hear to make a sunset paddle one of the more enjoyable experiences on Phi Phi. Cliff jumping and snorkeling with the sharks are 2 other water sports of note but the daily speedboat and long tail boat tours of the island are tremendous experiences and full of scenic beauty. 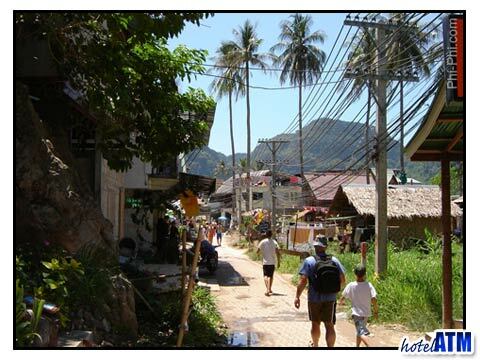 There are 2 View Points on Phi Phi Don both with outstanding views at sunrise and sunset. The traditional viewpoint takes you up past PP Phitarom Resort and takes 25 minutes to reach the top. From hear you have the classic dumbbell view of the island and it is best to try to get up their for a Photo at High tide to get the full blues of the sea. The second view point is another 10 minutes further on and has better views of the dumbbell but as it is at the top has expansive views out towards the Krabi Province. The main Phi Phi Don village is in between Loh Dalum and Tonsai Bay and starts just next to the main Pier. The village ia 300 X 400 meter squared of old and new buildings that are home to a large variety of shops, guesthouses, resorts and hotels. The village life is part market part bazaar with definite nightlife and and restaurant streets and general roads where you can buy every thing from souvenirs to toothpaste, sim cards to snorkels. The best Nightlife on Phi Phi Don can be found near the Reggae Bar and Velvet Dojo where you can share a beer and dive story as well as enjoy a dance and even watch a Thai boxing bout.There are some great bars on the beach like the Apache, Hippies and the Rolling Stone Bar but these beach bars tend to vary alot in popularity. It is no trouble finding out which is thin in place that night. The Tsunami of 2004 hit the island and over 700 people died. The Tsunami struck Loh Dalum Bay the most. Conservationists, ownership rights and other issues delayed rebuilding, however, rebuilding is now underway for the hotels, resorts, bungalows and restaurants destroyed by the Tsunami. In 2010 for Loh Dalum fore shore is not completely developed but the PP Princess Resort and PP Charlies plans for 2 super resorts are well on their way. It is important for visitors to Phi Phi Don and the whole of Phi Phi Islands to make sure the information they are receiving is the most up to date. Many sources of information on the Internet are outdated or inaccurate which can leave travelers in a bad situation. We work had to continuously update the information on Phi Phi Don and the other islands as much as possible in order to help travelers plan the ultimate holiday to Phi Phi Don and all of the Phi Phi islands. Visitors often marvel how this small island chain can boast so much natural beauty, great activities, wonderful food and terrific nightlife. Unlike virtually any other holiday destination they have ever been to, visitors to Phi Phi Island get to enjoy the best of everything and many many return each year.